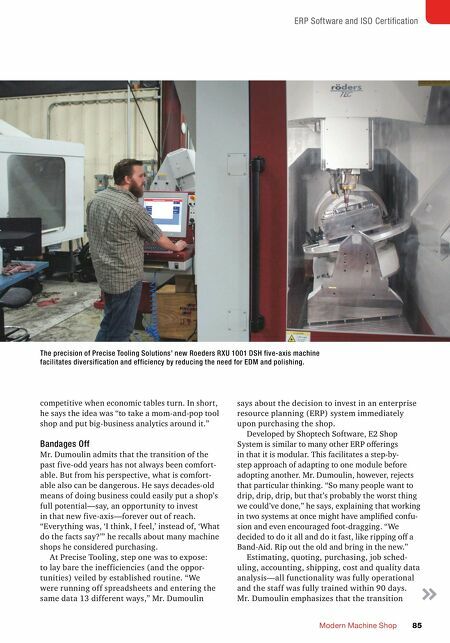 ERP Software and ISO Certification Modern Machine Shop 85 competitive when economic tables turn. In short, he says the idea was "to take a mom-and-pop tool shop and put big-business analytics around it." Bandages Off Mr. Dumoulin admits that the transition of the past five-odd years has not always been comfort- able. But from his perspective, what is comfort- able also can be dangerous. He says decades-old means of doing business could easily put a shop's full potential—say, an opportunity to invest in that new five-axis—forever out of reach. "Everything was, 'I think, I feel,' instead of, 'What do the facts say?'" he recalls about many machine shops he considered purchasing. 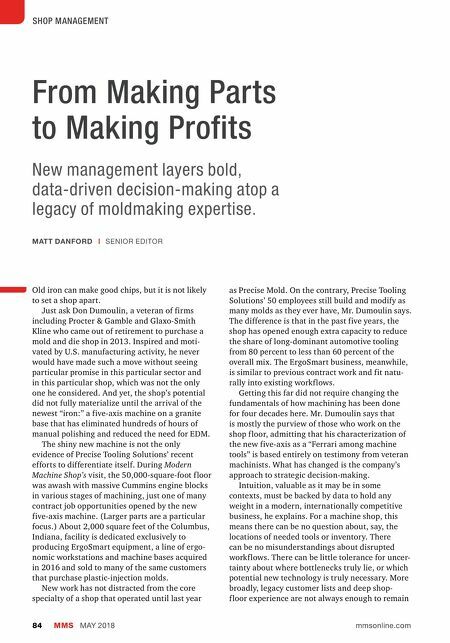 At Precise Tooling, step one was to expose: to lay bare the inefficiencies (and the oppor- tunities) veiled by established routine. "We were running off spreadsheets and entering the same data 13 different ways," Mr. Dumoulin says about the decision to invest in an enterprise resource planning (ERP) system immediately upon purchasing the shop. Developed by Shoptech Software, E2 Shop System is similar to many other ERP offerings in that it is modular. This facilitates a step-by- step approach of adapting to one module before adopting another. Mr. Dumoulin, however, rejects that particular thinking. "So many people want to drip, drip, drip, but that's probably the worst thing we could've done," he says, explaining that working in two systems at once might have amplified confu- sion and even encouraged foot-dragging. "We decided to do it all and do it fast, like ripping off a Band-Aid. Rip out the old and bring in the new." Estimating, quoting, purchasing, job sched- uling, accounting, shipping, cost and quality data analysis—all functionality was fully operational and the staff was fully trained within 90 days. Mr. Dumoulin emphasizes that the transition The precision of Precise Tooling Solutions' new Roeders RXU 1001 DSH five-axis machine facilitates diversification and efficiency by reducing the need for EDM and polishing.